On paper, this is a complete blowout. Local hot spot making hand crafted burger creations vs. a near fast food chain? No contest, right? Well, it’s a little more difficult than that. Mostly because Five Guys is really freaking good! They might have a ton of stores around the country and been one of the fastest growing companies recently, but you’d never know it by tasting their food. Nothing tastes mass produced. From the bun to the toppings to the burger patty, everything is fresh and delicious. It tastes like what a classic burger should taste like. The patties are a little thin and the bun sometimes doesn’t hold up to the massive contents inside of it, but the flavor is 100% there. The best example of their quality? The bacon. It’s crispy, crunchy, and piping how from the grill. Not fatty or stringy like most fast food bacon. Definitely one of the highlights of their burger. Five Guys upset the #3 seeded Finley’s Pub in the first round of the Denver Burger Bracket, and is looking to continue it’s Cinderella run. Highland Tap and Burger (HTB) advanced over the local legend Bud’s Bar in the first round, and actually did it pretty easily. With their downright unctuous burgers full of savory flavors, it was pretty easy to beat a generic flat top burger. Pulled pork, fried eggs, truffled mushrooms, and chimichurri sauce are just a few of their delectable burger toppings. As I stated in their first round recap, I wish the bun held together better and the burger wasn’t crammed into a basket laying on top of your fries, but it’s hard to argue with taste. Their burger patty is big and meaty, cooked perfectly for a juicy burger. 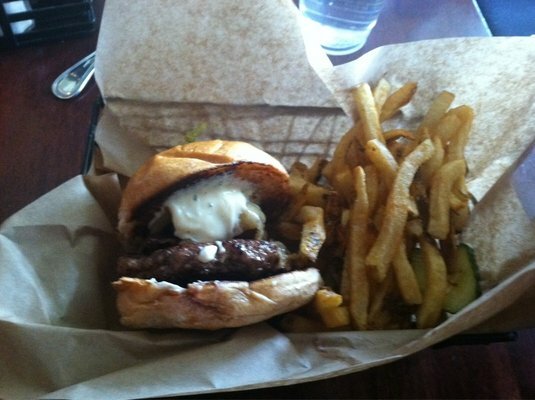 Yeah it can get messy and saucy, but sometimes you’ve gotta get dirty to enjoy a great burger. Would have been a complete travesty if HTB lost to Fiveguys… This whole bracket would have lost its credibility. I am just hoping you were trying to add tension to the review. Two completely different burger echelons. Noel – like we said we know what most people instantly think when comparing burgers like these 2. That being said, just because a burger is from a chain, doesn’t make it any worse. 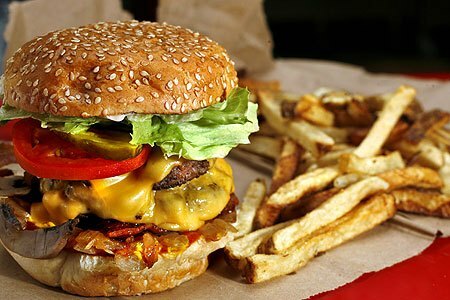 It’s all about taste, and Five Guys is a great burger. We chose Our Winner fair and square, but just wanted to point out that it was closer than it looks on paper.